Case Study. Fire rated glazing helps historic university preserve its past. The architects specified SuperLite II-XL 120, a clear, fire resistive glazing product that meets the ASTM E-119 wall standard for up to 2 hours. When the University of Michigan embarked on its first major addition since the opening of Hutchins Hall in 1933, preserving the collegiate Gothic-style architecture was of utmost importance. 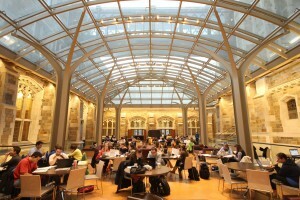 The University of Michigan Law School, founded in 1859, is an institution rich in tradition and history. One of the focal points of this monumental construction project was a new common area serving as a gathering space for students, faculty and staff. The Robert B. Aikens Commons was built on an unused grassy courtyard between Hutchins Hall and the Legal research building. Its glass and steel roof and open design affords unobstructed views of the picturesque stone walls and the beautiful stained glass windows that surround it. However, the proximity of the newly constructed common area to Hutchins Hall posed a unique challenge to the building team. Because these structures were too close to each other, the building code required a 2-hour fire rated barrier between them. SAFTI FIRST worked with the architects and the glazing contractor on a solution that satisfied the code requirements and preserved the original appearance of the building, which included historic stained glass windows and aged limestone. The architects specified SuperLite II-XL 120, a clear, fire resistive glazing product that meets the ASTM E-119 wall standard for up to 2 hours. SAFTI FIRST supplied the SuperLite II-XL 120 product in various sizes and pattern cuts as requested. SAFTI FIRST also worked with Edwards Glass during the installation. First, the existing stained glass windows were carefully removed. Then, the SuperLite II-XL 120 units were installed within a tube steel structure using SAFTI FIRST’s EZ Framing System, which was surrounded by decorative limestone. Once the SuperLite II-XL 120 assemblies were in place, the existing stained glass and newly created matching stained glass were installed on both sides. Because the SuperLite II-XL 120 units are clear, students, faculty and staff can still look through these historic stained glass windows without noticing the 2-hour fire protection that it now provides. The approach taken by SAFTI FIRST and Edwards Glass is definitely in line with the architects’ overall goal.